This is an old article but it’s the first time I’ve seen it. https://www.reuters.com/article/us-autos-singapore-idUSKCN18B1KM We all know Dubai is supposed to be the epitome of excess where you can go to a vending machine and buy gold bars but it seems that Singapore have taken it one stage further. They have loaded an automatic car park with super cars where you can stick your credit card in and get a new car. Here’s a random video I found online For anyone who believes texting and driving is ok, I have been in this situation. This is a true story. I was coming home from a backyard babies concert. Me and my friends were sitting in the back of the bus drinking cans of Guinness. The bus went around the corner and slammed into the back of a lorry full of bricks waiting to turn into a road. The driver of the bus wasn’t watching what he was doing. I ran to the front of the bus and pulled him out. I never heard anyone scream in so much pain in my life. The bus drivers legs were cut off. A couple of us took our belts off and tied them around his leg stumps so he didn’t bleed to death. He lived thanks to us but now he’s in a wheelchair Texting and driving isn’t cool. If you see anyone texting and driving, please inform them that it isn’t cool. Adh mor Renwick! Irish for good luck Renwick. It was always a pleasure to chat with you. Would be nice if you came back to carnity and shared some of the Indian car scene with us. Is there anyone knows good clean manuel Cherokee for sale? @Sajith Kumar I will be coming with my family so I'm sorry, else I would have loved you for company. @Atif bhai, we would definitely need your cafeteria with Karak Chai. @sertac welcome back bro after your honeymoon period. BTW the AFC went perfect. Congratulations on your hard work, got all stadiums ready on time. After I got the SLK 1 week later I came across to a huge traffic. I turned right and tried to find another way. I found one but it was a sand road. I am seeing my home from the place I am standing. I just need to pass the sand but obviously SLK can't do that. So I turned back and find the road but there was curb between me and the road I supposed to be. With Jeep I could easily pass it. With SLK I turned back. I lost all that time and I waited in that traffic. All that cost me 1 hour. Trip Report: Wow. Amazing. Exciting. I just seem to run out of words. My best Liwa trip ever, well planned, well executed and the best 5 cars for the job. The excitement was so obvious that neither the people who decided to go to Liwa overnight and camp, nor the people who decided to sleep in their beds and drive to Liwa in the early morning hours got more than 3 hours sleep. As we started calling each other, everybody was wide awake and ready to take on Liwa. Everyone met on time, we filled our cars with Petrol and extra cans as well for emergency. We adjusted the fire wood into all the cars and set off. As we approached the area to enter we were awed by the size and formation of the dunes around us. @Gaurav bhai made the best decision to change the entry point from a more approachable dune. As we deflated and got the briefing for the first part of the day and what we need to concentrate on, we also set the convoy numbering which would be crucial in this area. With @Gaurav bhai in the lead, @EmVarlet in second lead, @Asif Hussain right in the middle, and @skumar83 and myself making way for the sweep duties. As we entered and played around for some time, we realized that portions of the dune were very soft and we needed to push our stock cars to get through the terrain. Playing on these dunes was absolutely amazing, but we needed to be cautious as some of these dunes formations were very different than the ones we are used too. The best part of this area is when we have to drive down steep tall dunes and the cracking of breaking the sands with your tires. I had missed this sound for a whole year. As we came close to Friday Prayer time we switched to plan B and drove on road to the Moreeb Hill. After reaching there we were told that they do not have Friday prayers in that area. After playing on the Moreeb hill for some time we settled down to have lunch. After a quick lunch and smiling faces we washed up, packed and headed to offer our Qasr prayers. This bought our journey part 1 to an end. Part 2 was also well planned and we headed from Moreeb to Arada. This was wonderfully planned to give us enough time to play in some of the most gorgeous dunes, find our way through some mazes with the help, patience and understanding of the best team ever and some tracks to cover time. We came across several challenges and the team stood up to take every challenge with a huge smile and enthusiasm. This area is not for everyone as both the formation of the dunes and some very soft patches makes it difficult to drive in this area. We even encountered the tire pressure raising by 4 PSI to make it difficult to climb, so we had to monitor our tire pressure constantly. We were almost through our second phase when I heard a strange sound from my car, it seemed my tire had popped. I came to a flat surface and inspected the tires but there was no pop-out, so what was making that sound? At this point I went back to inspecting my tires when I saw the driver's side from tire pushed back into the fender of my car. Luckily Jalil was at hand to take a quick look and announced that the Lower arm was bent. Now discussions started as to how we can get the car out of the desert, it was definitely not going anywhere on the night, and we were just about 5 kilometers away from the point we were supposed to camp at, so we decided to make that our camping spot. The first suggestion and plan of action was to remove the lower arm and pull it with @Gaurav bhai winch and @skumar83 car. As we tried our best and put the whole thing back in, it had not made a lot of difference. The new course of action was Jalil started removing the mud guard which made little difference, he went on to remove the cover inside the wheel well which made a little more space, but getting the fender off made the space and gave the car a fancy look. We were all hungry by now, so after starting a bonfire, setting up the tents and @skumar83 warming up dinner, we were on the food like a pack of hungry wolves. after dinner we all sat around the fire admiring the weather, the quietness and the beauty of the surroundings. Finally we went to sleep. Upon waking up the next morning, breakfast was served, we all had a good fill. Heading to my car I saw that the wheels were pointing in opposite direction which would have its own set of troubles on hard surface so Jalil adjusted the wheel till i was able to drive it again. After a quick pack-up and thorough check around we were on our way to the last way point and out. Here we saw a lot of black camel farms with a lot of baby camels around. While I called for recovery and due to delay we started off to Birbir Ghost Town, after circling what used to be the Ghost Town, Gaurav Bhai aptly announced on the radio that they have demolished it and we neither were able to see the ghosts or a town. We played around for some time, headed back to my car, started inflating the tires while I waited for the recovery truck. After a episode with the recovery truck we loaded my Pathy onto the truck and headed off for another adventure while others headed back home. The recovery driver told me that he had to leave lunch to come save me, my hero. His room was on the way and if I mind if he would stop for lunch as he is not able to eat out, i agreed. Than he asked me if I was hungry and took me along for a nice home cooked meal. After the meal we set off and thanks to @Asif Hussain who stayed back with his family to make sure I had a helping hand when trying to source the parts and the mechanic to fix it. After a quick fix we inflated my tires and we head back home as well. Wonderful day and night and day out with amazing people and great team work, this is part of the reason the Liwa trip was such a huge success. Other reason was the immaculate planning, back planning. good decisions made at the right time and a capable trip[ leader with all the help he could ask for. Until next time.. Adios Amigos!!! What are the reasons to get excited about new Camry? Lol!! Don't say that.... Its a beautiful and spacious car. and the latest model has been designed very well. I have always noticed the spaciousness of a Camry compared to other sedans in the same range.. It's a very comfortable car. 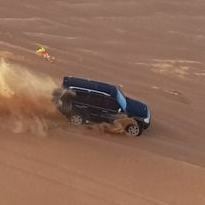 @William Manning you must be joking by saying Toyota Land Cruiser is the best offroad vehicle for dubai desert.....! Don't be mistaken by desert safari choice as they use Land Cruiser as a donkey for daily track and hardly do couple of sidey's to impress. Real expert off-roader can drive corolla on the same desert safari track. These people choose Land Cruiser as it is cheapest to maintain and damn reliable than any other SUV in UAE, but it is not "best off-roader". Why it is not best, because it has THE WORST body weight-power ratio and its long wheel base make it less appealing for dune crossing or ridge riding. In new models LC200 that comes with lower lip that get bashed up in first two drive and cost a fortune to fix. This misleading info from desert safari impression cost too much for every individual who think if safari guys using this for commercial use then it must be the best 4x4 out there. No it's not, I'm sorry.